So you’re new to Half-Pint. Maybe you have a little one on the way, or you’ve just moved to the area. Maybe you just got word of this great resource for your family, and you are wondering – how does this all work? From a purely logistical standpoint, Half-Pint Resale doesn’t have a “home” per se. We love our current location, but because Half-Pint Resale is a four day pop-up event kind of deal, we are mobile. 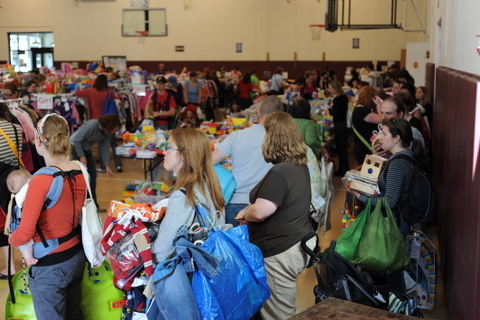 Half-Pint Resale is twice per year, taking place in both spring (featuring spring and summer clothing) and fall (featuring fall and winter clothing). Our current location, which we love and adore to the enth degree, is the Goodman Community Center and their lovely lovely gymnasium. They kindly tell all of their regular programs to take a week off and they let us take over their fine center. All of the “stuff” (racks, etc.) live in various places around our homes. An office? That would be our dining room tables, which, after our day jobs are complete and our children go to bed, we fortify with our laptops, Cherry Coke Zero, Coffee, Microwave Popcorn, and all forms of Gummy candies. Where does all of the stuff come from? Hundreds of families out in the community have it all stored away in their basements in big giant bins right this very instant! Whether they have been holding on to it for sentimental value, or they have always wanted to find a way to retain a little of it’s original purchase price by reselling it, it’s a treasure for another family waiting to be found. This “stuff” is all items that are geared towards pregnant moms, newborns, to kids around the age of 7. It’s strollers, it’s pack and plays and exersaucers, it’s breast pumps and cloth diapers. It’s tremendous amounts of clothing and toys. If it’s something you are looking for – someone out their in the community has it and would love to pass on the good deal to you and your family. Great! Consignment is actually a fairly easy process. There are a lot of details on our website, but basically it goes like this: You read the consignor agreement (which basically states that you will hang, tag, and price all of your own items per our basic guidelines, and then in return will receive 70% of the sales minus a small $5 consignment fee). You sign up to be a consignor online, and then we send you a consignor number, which you use on all of your tags to identify your items. 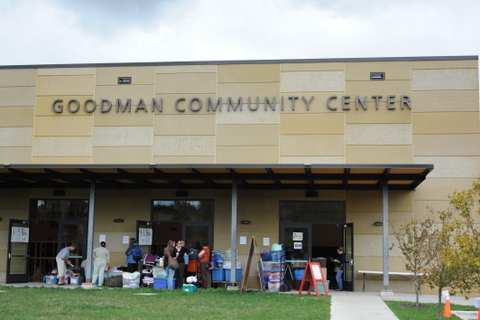 You bring the consignment items on the Thursday before the sale to the Goodman Community Center (during a specified time). Fabulous volunteers check all of your items in and you put them on the sales floor. Done, you brush your hands of the items and squeal in glee. The entire sale is set up on Thursday night after Consignor Drop-off is over. For a few hours, a few volunteers and ourselves sort and label like mad-people and finish up final tasks. Friday is a fun day. There are two presales before the sale itself is open to the general public. The first is the Volunteer Presale. We treasure our 150+ plus volunteers, so the first is a thank-you all for them. As a special perk, Volunteers are eligible for bringing their children. The second is the Consignor Presale. Each sale lasts an hour and a half. The public sale opens at 2pm. During the sale there is a volunteer in the “Gear/ Large-Item” area to help you if you want to purchase one of these non-carry-able items. There are also volunteers with question marks on their backs, there to answer any type of question you might have. 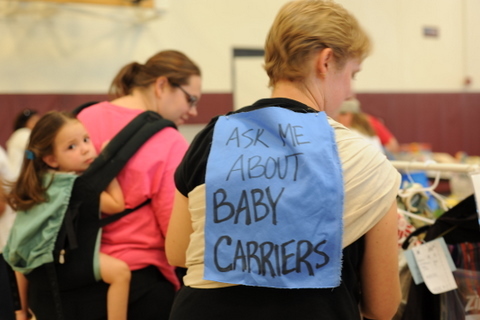 There are volunteers in the Baby Carrier area to help you become acquainted with the different types of carriers available. You also will find volunteers helping with line management, checking people out, at the cash registers, and doing data entry. Finally, you will find a volunteer in our “Loot Valet” area, which allows folks to purchase items and leave them by the door for easy car retrieval and stuff pick-up. The sale takes cash and check at the moment. And we love it when people bring their own bags. Yep, on Saturday, when we open in the afternoon at 1pm, everything is half-price, accept for a few items that have green tags (and will be over the $75 price). 1-5pm on Saturday is bargain hunting mania!!! It all happens in reverse. Items are sorted – some go to a local charity and are picked up that evening and taken away, and other items get sorted back into the 200+ bins that were left by folks who wanted their items back (it’s a big BIG task). Everything is taken down and loaded back up into the U-Haul. We go home and collapse, and come back Sunday morning for about two hours to make sure everyone who wants them gets their bins back. All consignors get their checks in the mail within ten business days. But what can you really find at Half-Pint? Oh, you can find a LOT! Prior to the sale I fill out our cheat sheet, and am often able to score something in every category on the list. I’ve seen most every baby contraption you can imagine, not to mention trendy baby carriers, strollers, diapers. If you think you might need it or want it, we probably have it. Items are generally priced at about one third of their original value. I hear there are lines. It’s true, there are lines. When you are trying to move 15,000 items in and out of one somewhat small room in a matter of just 16 hours, there are bound to be a few lines. We do our best every sale to tweak the check-out process. Know that we are constantly watching and assessing! Go to our website, click on Volunteers, and fill out the online registration form! You don’t need to have prior Half-Pint experience! Volunteer shifts are three hours long, and entitle you to a pass to get into the Volunteer Presale! Good stuff. Just ask! Lisa and I are always happy to be in touch! Just send us an email at halfpintresale@gmail.com. Oh, and WHEN is the next sale? We would be remiss if we didn’t remind you of that – You can find all of the information HERE. Also check out consignment information (here) and volunteer information (here).